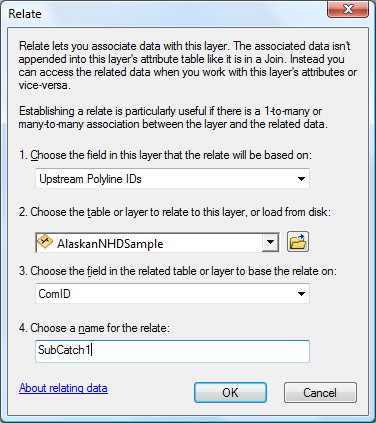 •In this section you are going to use the segment ID table you created in the previous section to create a selection on a sub-catchment, this is very useful in finding what's upstream. The selection could be used to tally up network statistics or used in a spatial selection (e.g. used to select monitoring sites). An example using another network is described here but this walk-through will use the supplied sample data. 2.Click on the Add Data button and navigate to the folder C:\RivEX\Demo_Data\RivEX_Workspace\Output. 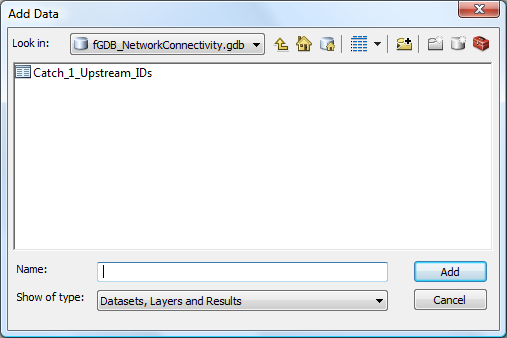 3.In this folder is the GeoDatabase fGDB_NetworkConnectivity.gdb, double click on this to enter it. 4.In the GeoDatabase there is a single Table. This is the segment ID table for catchment 1. If for example the Alaska data had 3 catchments and their IDs were 10, 20 & 30 then you would have seen 3 tables called: Catch_10_Upstream_IDs, Catch_20_Upstream_IDs, and Catch_30_Upstream_IDs. Select the table and click on the Add button. 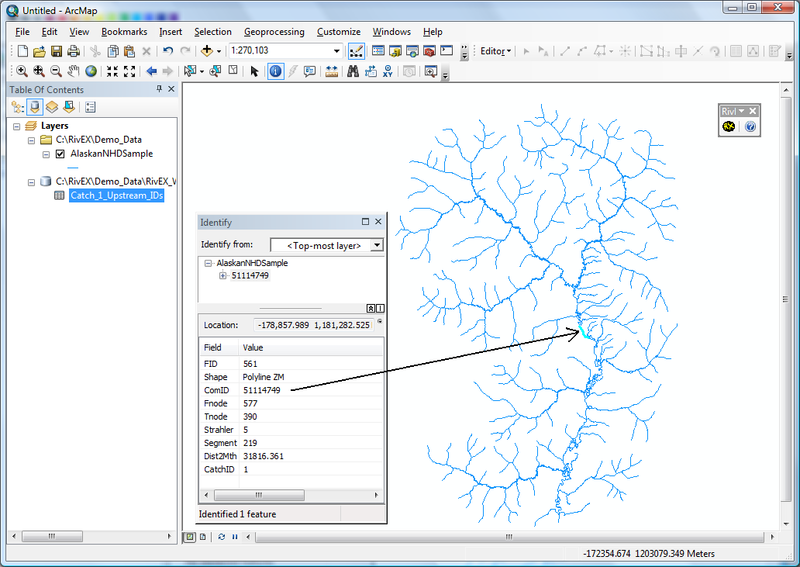 7.Now zoom into any part of the river network and use the identify tool to get the ComID of the polyline. In this example I have clicked on a polyline 51114749. 9.Complete the attribute query as shown in the image below but replacing the ComID in this example with the number you identified. Press Apply then Close. 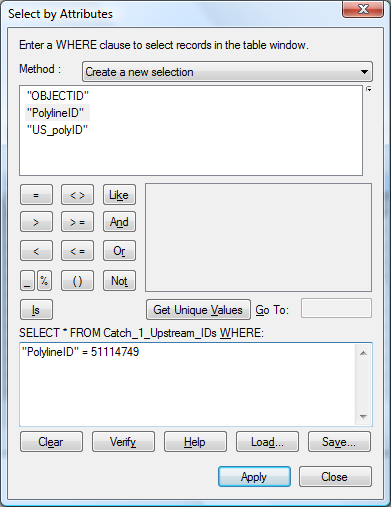 10.You will have selected all rows in the Catch_1_upstream_IDs table where PolylineID was equal to the ComID value. Finally you need to run the RELATE to pass this selection to the spatial dataset. In the Attribute Table simply click on Options > Related Tables > SubCatch1. 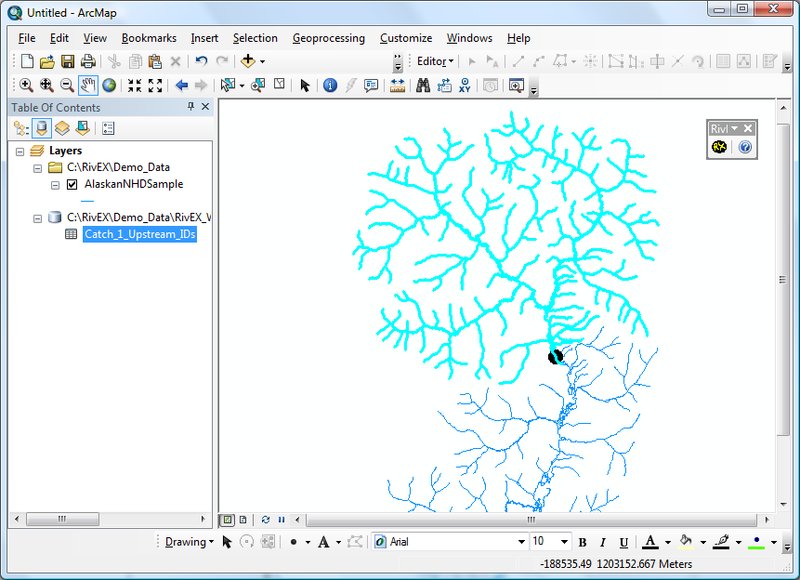 This will select all upstream polylines. In the image below I have marked the polyline 51114749 with a black dot and zoomed to the extent of the selection.